My husband and I were overjoyed to have our first baby back in 2006. We were both employed at the time, and after a short maternity leave I was more than ready to head back to work. The problem, however, was childcare. While it’s a blessing that provides parents the opportunity to return to work, it can also take an impressive chunk out of your paycheck. Before you return to work, consider the costs of care in your area, the alternatives, and how much help you really need. In my case, daycare actually wasn’t worth it. After a few months of juggling a corporate job with a new baby, the costs – both financial and emotional – were simply too high, so I decided to quit and become a stay-at-home parent. Every situation is different and should be based on what’s right for your family, but a general idea of how much childcare costs can help you better understand how it could affect your bottom line. At the end of 2013, the median income in the U.S. was just over $53,000, according to the U.S. Census Bureau. The average family spent about $143 per week on childcare, totaling nearly $600 per month. Families under the poverty line spent about 30% of their income on childcare, while families above the poverty line spent only 9%. Childcare costs varied greatly by geographical area – daycare in Massachusetts and New York regularly topped $10,000 per year, while Kentucky and South Carolina were between $5,000 and $6,000 per year. Parents can expect to pay anywhere from $4,460 to $13,185 per year for preschooler childcare. The price of care varies depending on your child’s age. Expect to pay more for newborn care, as state laws regulate ratios of daycare workers to children, and these vary by age. If a smaller ratio is required, that results in higher overhead for the daycare center – meaning you pay more. Type of Daycare You Need. Some daycare centers are all-day only, while others have part-time options. A drop-in center may charge more per hour, while a daily center may require you to lock in a rate with a signed contract. Scope of Care. If you want care, meals, education, and developmental play, you can expect to pay more for those services. A larger scope of care usually costs more, which is why daycare centers generally charge more for younger children who require more attention. Proximity to Your Work. Daycare in urban areas is often more desirable simply because it’s more convenient to drop off and pick up your kids. However, you also need to consider how convenient it is for you to pop in on your lunch break, pick up your child if sick, or, if you’re still pumping or nursing, coming to the center throughout the day for feeding. If you need your child’s daycare to be close to work, you may end up paying more for a prime location. Recommendations and Desirability. You don’t want to find just any daycare center – you want one that comes highly recommended from other parents. You’re entrusting your child to another adult, which means you may be willing to pay more to score a spot in a highly recommended facility. Increased Illness. The CDC estimates that 20,000 kids under the age of five are hospitalized because of the flu each year. Younger kids in daycare are especially susceptible to illness because of their immature immune systems and close proximity to other children. However, illness doesn’t just affect your children – you may be required to take sick days yourself in order to care for them. Depending on your company’s benefits package, this can mean less take-home pay, something that should factor into your decision. Food Costs. You may need to pay for a food package at your chosen childcare facility, or purchase and assemble lunches at home for your kids. Possible Low-Income Assistance. 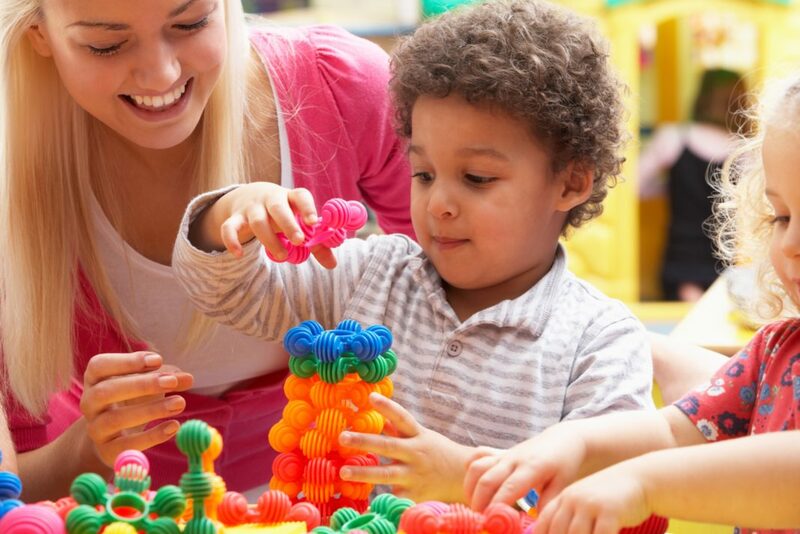 Depending on your income level and the programs available in your state, you may be able to obtain financial assistance to help make daycare more affordable. While each state’s income requirements and subsidies vary, you can usually find out more by visiting your state’s Department of Human Services website. For example, in some states, you can qualify for subsidies as long as you make less than 200% of the state poverty line, making it an option for both low- and moderate-income families. Once you’ve factored in the various contingencies that can affect how much you pay for daycare, it’s possible to find ways to whittle down the cost so it eats up less of that all-important paycheck. If you’ve assessed the true costs of daycare and decided to go for it, there are several ways to make sure it doesn’t eat up all of your monthly income. By doing your homework, you can avoid overpaying while still getting the best facilities and caregivers for your little ones. Ask your social contacts what they’re paying, how they like their daycare centers, and whether or not they’d recommend them to you. Then, start the vetting process. Visit the facilities and test the waters to see if they’re worth the price. What is the child-to-worker ratio, and is it within your state’s daycare regulations? Can I see the center? What types of activities are available? What is the schedule for a typical day at the center? Do you allow parents to visit their children throughout the day? What are your meal plans like? Can you accommodate special diets? Do I have the option to bring our own food? Do children have naps at this center? Is there a dedicated area for rest? How do you handle discipline? Do you go outside? Is there a safe play area and may I see it? Do you have references for past and current parents whose children have used this center? It may also be worth your while to look beyond traditional daycare centers. Regulated and registered home-based daycare can be just as reputable as center-based care, but it has lower operating costs, and therefore, lower fees and pricing much of the time. Community centers and even schools may offer daycare services for limited hours as well, so be sure to familiarize yourself with all the options. Some facilities tack on additional fees that can make childcare more expensive, including a meal plan, late pickup charges, and more expensive daycare models such as Montessori-based programs. A good daycare center should provide you with a fee schedule for various add-ons and penalties that can drive up costs, so be sure to ask for one and confirm which are necessary and which are optional. For example, you may be able to negotiate a better rate if you provide your own food or opt out of field trips. You may also be able to get a better deal by entering a long-term agreement, such as a month-to-month contract rather than paying a “drop-in” rate. Of course, the rate and contract you choose depends on the nature of your career. Those with full-time positions may find that longer-term contracts make more sense than those with part-time or shift work when care times may be irregular. If you have more than one child who needs care, the cost can be overwhelming. One way to help your bottom line is to ask facilities if they offer sibling discounts – many offer reduced rates for a second and third child. Some daycare and childcare facilities don’t necessarily volunteer that information, so be sure to ask during the interview period. Depending on the parental leave packages offered by your place of employment, it may make more sense to have one parent take a year off to care for a new baby. Don’t forget, daycare costs are based on the child’s age. Infants and toddlers are the most expensive because they require more care and may increase the number of employees in order to satisfy your state’s worker-to-infant ratio regulations. If infant daycare is too expensive (for instance, in Massachusetts, it’s well over $16,000 per year), it could essentially negate a parent’s entire paycheck. Waiting until your baby graduates from toddler-hood can offer more baby bonding time and more money in the bank. If you can juggle your schedule, your child can spend less time in daycare – and that means spending less money. If your or your spouse’s boss is flexible, see if you can rework your schedule to help reduce costs. When I had my first child, I was able to adjust my schedule to work only mornings on Monday, Wednesday, and Friday. That reduction in the financial burden of childcare meant that it made sense to work a little less if it meant not having to pay for full-time care. You can also adjust your schedule with your spouse to alleviate costs. Working opposite schedules may require only a couple of hours of childcare every day, meaning you get to keep more of your take-home pay. Just be sure the constant balance between work and home life doesn’t overwhelm you and your spouse. Not everyone has the luxury of available family nearby, but if you do, see if they can help ease the burden. While Grandma doesn’t need to be your child’s sole caregiver, you may be able to reduce daycare hours if family members are willing to pitch in and help. You can even offer to pay them, or use your savings to pay for snacks, diapers, and other supplies needed to care for your little one. If your employer is willing to assist with daycare expenses, a flexible spending account (FSA) – sometimes part of an employee benefits package – can help offset costs. You or your spouse may be able to fund a dependent care flex spending account (DCFSA) with up to $5,000 tax-free each year, per couple. This money can then be used to reimburse your daycare costs. Just be sure to use it before the end of the year so you don’t lose the money in the account – you only want to fund your DCFSA with as much as you plan to spend. Also, you cannot use both a DCFSA and claim the childcare tax credit, so you need to decide which makes more sense for you. The childcare tax credit returns a percentage of your childcare expenses depending on your income, with a cap of $3,000 per qualifying child ($6,000 for two or more children). If you can open a DCFSA, and especially if you have more than one qualifying child, consider talking to an accountant to determine which option is better for you. Working from home can obviously be an ideal situation. It means spending more time with your kids and still supporting your family financially, all while keeping your professional skills sharp. Ask your employer to allow you to work from home some of the time, or consider branching out on your own and working as a freelancer. There are plenty of opportunities out there, but you have to make a thorough go of finding the right one for you. Just make sure you have a quiet place where you can actually get your work done. As a test run, take a weekend to work from home and see how productive you are. I “practiced” working from home for a few weeks before I quit my office job to ensure I could stay organized and dedicated enough to accomplish all my tasks. Depending on your career choice, you may be able to opt for a part-time position instead of full-time. However, by choosing to work fewer hours, you could miss out on benefits such as health insurance and paid vacation time. However, if your spouse qualifies for benefits through full-time employment, taking a part-time position may mean lower daycare costs without having to sacrifice benefits. Part-time employment also offers more flexibility in your schedule. If you don’t like the idea of leaving your little one during waking hours, you could choose a late-night or early morning shift to maximize your time at home. While you still may require some daycare, it could be more feasible for family to pitch in, and a drop-in center is always an option. In some cases, scaling back on work could actually help you come out ahead in the long run. Add up how much you can make in part-time wages and subtract what you’d pay in childcare costs, as well as any taxes you would owe. Then, compare that to working full-time and paying for more childcare. While you might technically make less with part-time hours, you could keep more in your bank account if you’re able to scale back on your childcare needs. Ultimately, only you and your partner know what’s right for your family, whether that means working full-time or opting for a modified schedule. Daycare can be expensive, but it may be your only option if you’ve got a demanding job. Consider the issue from all angles and decide what works best for your kids and your career – everyone’s answer is going to be different. What additional methods can you suggest to make childcare more affordable?